cholesterol. As an ointment used for sores, boils and ulcers. Devil’s Claw has been used as an ointment in connection with sores, boils and ulcers. It can also be used to cleanse the lymph system and to remove toxins from the blood. Devil’s Claw has been shown to reduce inflammation which is responsible for irritation, injury or infection. Inflammation generally results in pain, redness and swelling in the area of the damage. Devil’s Claw is a plant native to southern Africa found growing in the Kalahari desert, Namibia, the island of Madagascar and few other locations.The name Devil’s Claw comes from the herb’s unusual fruits, which are covered with numerous small claw-like appendages. Externally, Devil’s Claw has been used as an ointment in connection with sores, boils and ulcers. Used internally, it cleanses the lymph system and removes toxins from the blood. Traditionally Devil’s Claw is being used in Africa for a wide range of conditions. In the western world, it is used mainly for arthritis and other related conditions such as tendonitis. In laboratory and human studies, a chemical called harpagoside, one of the active ingredients in Devil’s Claw, has been shown to reduce inflammation which is responsible for irritation, injury or infection. Inflammation generally results in pain, redness and swelling in the area of the damage. It can occur within body tissues as well as on the surface of the skin. Not to be taken during pregnancy, as Devil’s Claw may act as a uterine stimulant. Reportedly, Devil’s Claw also has some effectiveness for increasing appetite and improving digestion. 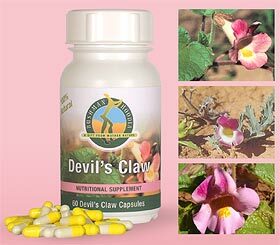 Extracts of Devil’s Claw are thought to reduce blood sugar levels somewhat and several of the chemicals in Devil’s Claw appear to affect blood pressure, heart rate, hearth rythm and contraction of the heart. However, no reliable scientific evidence supports the use of Devil’s Claw for diabetes or heart conditions. Usually 200 mg of devils claw standardized to 5% harpogoside is taken daily. When supplementing with this herb, always follow manufacturers instructions. Side effects are rare with the recommended intake of Devil’s Claw. Devil’s Claw is a non-toxic and relatively safe herb, with almost no side effects if taken at the recommended dose for short periods of time. However, it has been reported that high doses may cause mild gastrointestinal problems in some individuals .